I hope you all had a great Thanksgiving and enjoyed reminiscing on all the things you have to be thankful for. We enjoyed a whirlwind visit from my family. It was short, but enjoyable. Since this is the season of holidays and making memories, I thought I’d share a few of our holiday traditions that have been very meaningful to me over the years. Maybe if you are looking for a new tradition to implement, some of them will interest you. Shopping So this one isn’t that new or interesting, but we have enjoyed it the past 6 or 8 years since us kids have grown up. My parents were only in town one night and left after Thanksgiving dinner and some games, but my little brother and sister stayed to go Brown Thursday shopping with us. It’s something us kids like doing together every year–not even so much for the great deals, but for the fun we have together while standing in crazy lines and navigating insane shoppers who have forgotten the reason for this whole season. 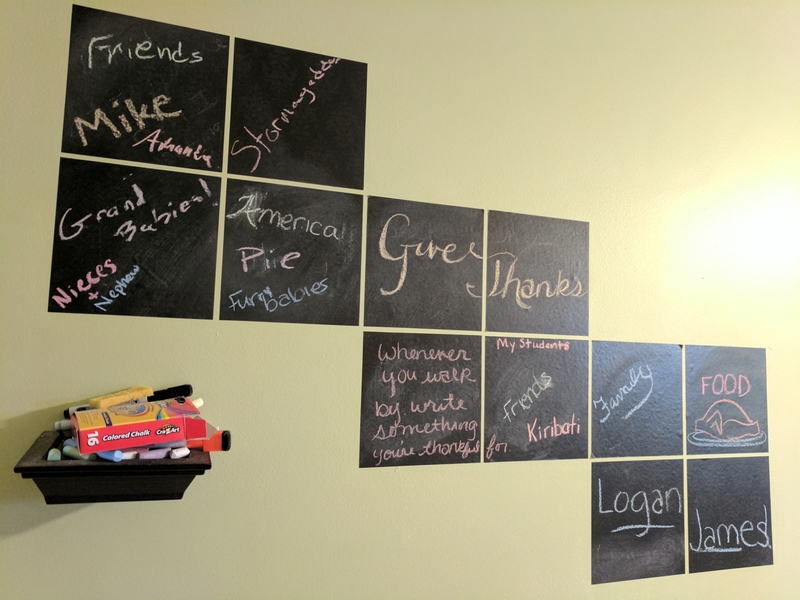 Giving Thanks Something new that I did this year is use my chalkboard wall clings in the kitchen as a thankful board. I asked people to write something they were thankful for whenever they walked by (or whenever they remembered). We also went around the table a few times and shared things we are thankful for. Now Christmas decorating is underway. It might be a bit of an understatement to say that I enjoy decorating for Christmas! I’m one that loves to decorate the whole house! Although, I have a long way to go in buying enough things to do that, believe it or not. So for now it’s just the living room, kitchen/dining room, and a miniature tree in the bedrooms. This is our ornament box… So many memories in here! 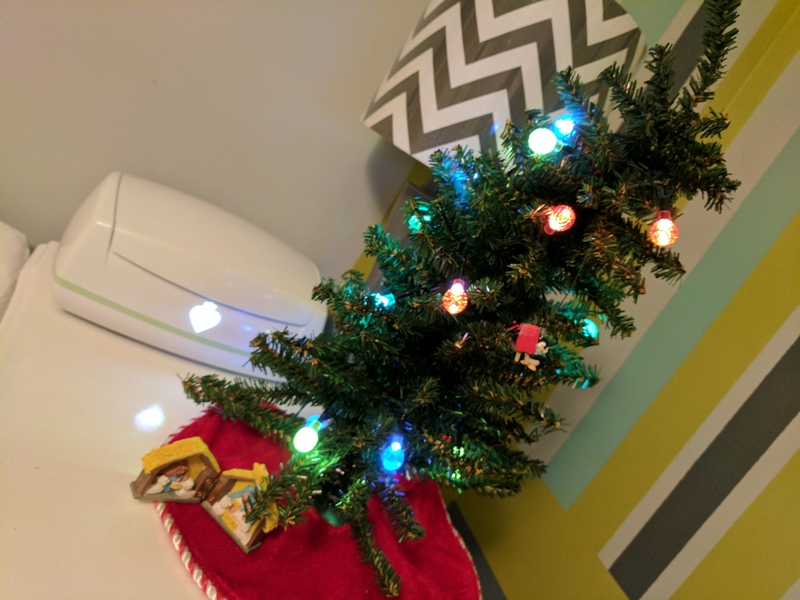 Mini Bedroom Trees It was so fun getting a tree for our son’s room the year! He won’t really appreciate it for a few years (this will be his first Christmas! 😊), but I wanted to start the tradition right away. I always had a little tree in my room growing up, as did my brothers and sister. I even took mine to college with me, and I was always the only one in our prayer group with a little bit of Christmas decor. 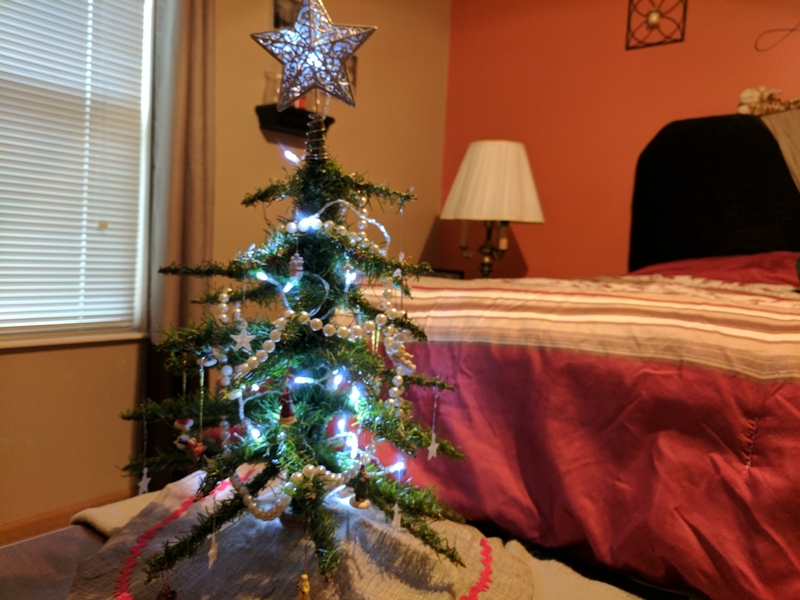 Now that same beautiful tree–albeit a very Charley Brown-looking tree at this point–still sits in my bedroom every year. Yearly Ornaments Growing up, my husband and I both received a new ornament from our parents every year. I LOVE this tradition because when we got married, we already had enough ornaments to decorate our first Christmas tree. Now that grandkids have come along, my mom is buying them ornaments every year too. 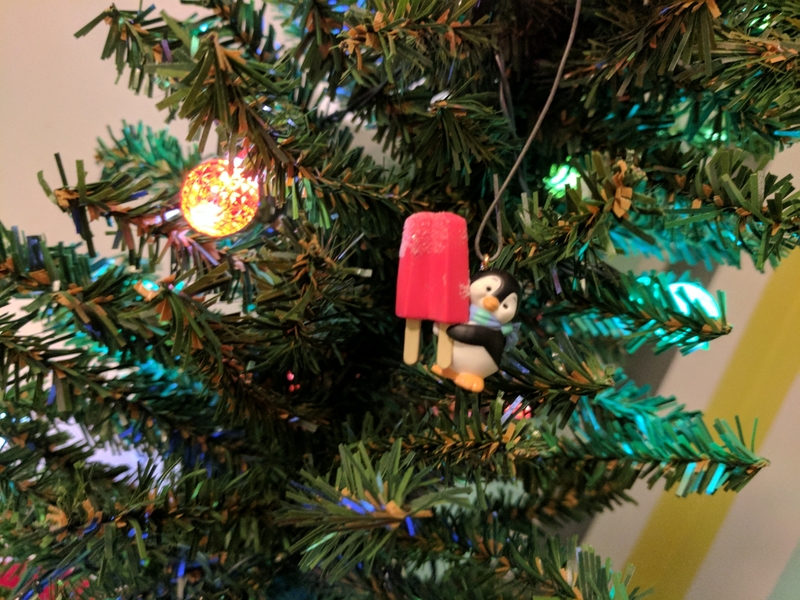 So, in order to carry on the tradition of us giving them ornaments, we decided to give our son a mini ornament for his bedroom tree every year. 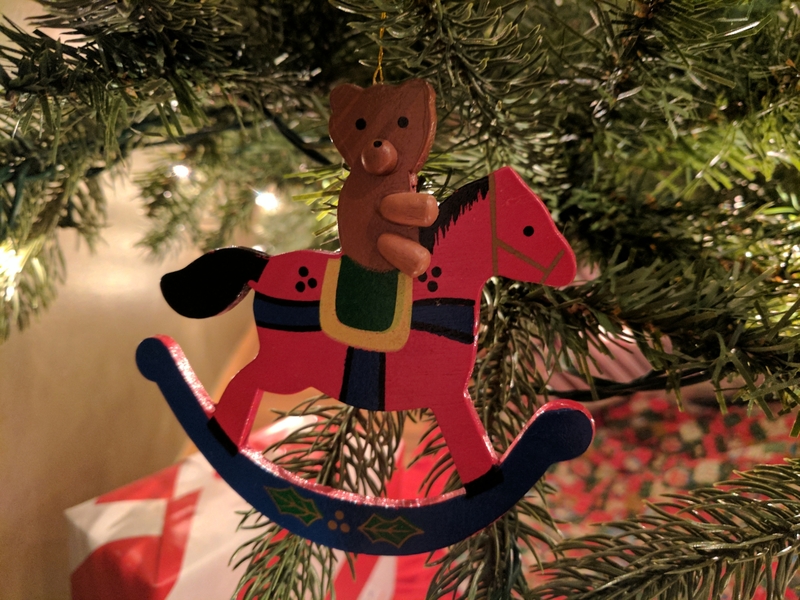 We found a Hallmark Keepsake mini ornament collection that just started this year, and we are really hoping it continues throughout his childhood. So cute! Well, the rest of the decor and traditions you will have to wait for. 😉 I’ll do a Christmas tour when it’s all finished. It’s taking a bit longer to decorate now that I’m chasing down a baby all day. But it will get done! In the mean time, what Christmas traditions does your family have? Share below in the comments.